All these stamps are from Winnie and Walter. I do love the combo of the turquoise and gold embossing. Again I have gone with one layer to help that postage cost not bankrupt me this Christmas! We are sponsored by Stitchy Bear Stamp and you could win 3 of their fabulous images. Please take a look at what our amazing DT have created here to inspire you. Love the simplicity of it! And the colors used! Love the gold one green Sandie.. This is gorgeous, Sandie! Lovely CAS design. Melissa - ATSM teammate. P.S. I think you could play this over at Just Us Girls #301 - Trend Week - GOLD. Fab OLC Sandie, you are right about the postage. Beautiful CAS card Sandie! Love the choice of colours! Beautiful card, Sandie! Love that color combo. Gorgeous CAS card, Sandie! I love all the gold, and your wreath is the perfect touch! I Love W&W products and you, Sandie, have showcased the images here beautifully! Elegance and class...WOW! 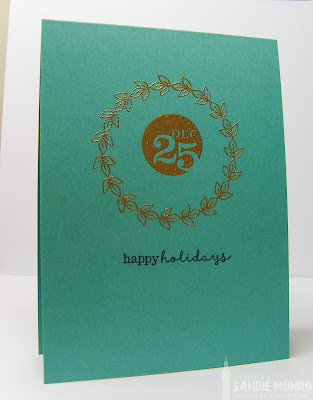 I love the teal/gold combo too, its very modern and stylish for a Xmas card. Good call on the one-layer idea too, posting is becoming so costly. And they have just cut down our postal delivery to three days a week. So we pay more for postage and get less mail..totally makes sense...not!! Sweet card!! Love the gold embossing!! I totally get the reason for making Christmas cards one layer, but I haven't figured out how to avoid mine looking bland. There's something something I need to learn. So I'll continue heading over here, lots of CAS iniration to be found:) love the colors! This is just too darn clever! Love all the gold. Oh so pretty and what a great design! Thanks so much for sharing it with the OLS Challenge! Time Out Reminder and blogging break.